knitshop.co.uk is offering a wide range of knitting & crochet yarn all designer quality, all unique to us branded yarn, which is made of high quality fibres and natural materials. If you are interested in felting and spinning, there is a wide range of merino wool, wool tops, fleece & rovings, and 100% wool yarn for knit-felted projects. A full list of knitting and felting accessories can be found on the knitshop.co.uk website, ranging from the bamboo knitting needles, crochet hooks through to dry felting tools to soaps for wet felting. Shopping on our site is secure - the site: cart, checkout, payment and your account details pages are protected by a secure certificate (128bit encryption - the golden padlock), and the sensitive information from our customers is encrypted to bank level security standards. GDPR we keep your details safe! knitshop.co.uk is GDPR compliant! Twister Wool Yarn - a twister has arrived! November reminds us that there is always something to be thankful for! 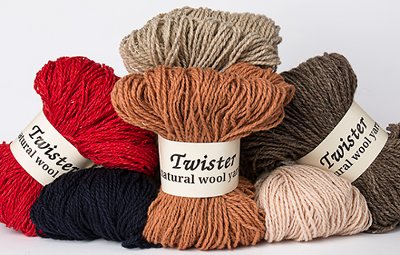 Get 25% off this month of our 100% pure Twister Wool Yarn. Aran weight wool yarn with 200m per 100g hank. Check out our special offers and get your bargain this autumn! It is difficult to say what is impossible, for the dream of yesterday is the hope of today and the reality of tomorrow. Robert H. Schuller. A great quote, and with those dreams we love the craft and create new things. 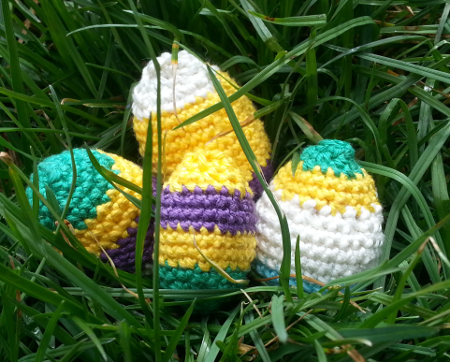 Download this free pattern today and make your very own Easter decoration. Materials: Coquette Vintage Cotton Yarn, or Cotton DK Yarn. This is great for using up scraps and left over yarns from your stash! Make a few for the table a lots to decorate the whole house. FREE SHIPPING on UK orders of £16.90! And if that's not enough we offer returns with full money back guarantee*!